Well, I've finally added the UEO EVA Gallery(click here to go to Galleries) and our first EVA craft. Presenting the seaBug. This craft is very similar to the seaCrab, but is significantly larger to accomodate on-the-spot experiments for those missions involving specimens highly succeptible to degradation after removal from the sea. Great News! We now have a chatroom available for use. Click here to use the java chat client. Those of you with your own chat client click here. We have three new images for your viewing pleasure. 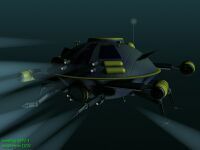 Two images are in the seaArrow DSV gallery and the third is in the Midpoint Sub Base gallery. Enjoy. The new site is now underway as you can see. I admit not much new has been added. In fact, some images are missing. However you might want to see the new seaArrow image(located here), which can also be seen on the desktopstarships.com site. Please be patient with me as new items are added to the site. As it turns out moonfruit will soon be requiring a fee for its services. Having no intention of paying this fee...seaArrow will be moved soon. Please update your bookmarks and use this address from now on. Thank-you. I'm sure many of you may be concerened that seaArrow may be of a lesser quality after this move. This is simply untrue. I assure you that seaArrow will maintain all its currently existing forums and all other pages. This change, will, in fact eliminate some of the restrictions moonfruit places on it's websites. I will admit there will be some significant changes for the staff but do not worry they shall be worked out in due time. "Her future is up to us"
I would like to welcome members sr6301 and seafire22 aboard the seaArrow team. It is a fact...seaArrow is growing....and is sure to be a big hit fanfic in the near future. Don't you want to be able to say you helped make it happen. It won't work without you, the fans. Come and join the team and be a part of the action. Make the ocean come alve with mystery and intrigue as it did so long ago. Tell your friends about this exciting new frontier everyone of you can be a part of. Will YOU be the 5th member? We have a second staff member now working for the seaArrow series. Welcome aboard JacksonDecker. All members that join right now will be our framing provisional members. They will be given a permanent Captain rank membership after the period of provisional staff ends. When will this be? seaArrow will move over to it's production status structure when both the Pilot Episode and series "bible" are completed. We have our first member of seaArrow DSV. I would like to give quest2068girl a hearty welcome. She is capable of writing, photoshop graphics, and some minor 3d work. A much appreciated addition to the staff. Questgirl runs two seaQuest websites to my knowledge. Please be sure to visit them both. Well, seaArrow DSV is now unoffically up and running. May the fates look kindly upon this poor site as she grows onward into the future. ::smashes a bottle of wine on his computer:: D'oh! Copyright 2001-2002 All rights reserved.